Stories are stressing out our business leaders. That’s right, our leaders are getting anxious, on edge. Why? Well, as one general manager put it to me this week, ‘Everyone is talking about stories. We’re told we need to know our story—the story of our product, our program, the change we’re making. We have to find it, craft it and tell it. Everyone keeps telling us, “We need a narrative!”, but no-one is showing us how to do it’. I’ve discovered this is especially the case in industries renowned for great storytelling, such as the games industry, theme parks, creative agencies, even the movie business. In one part of the company there are the artistes happily crafting stories, creating the next big hit. Yet everyone else, those who aren’t directly involved in designing the next great computer game or ad, feels at sea. They don’t have their own story toolkit that helps them influence and inspire people at work. Do you need to tell your story but don’t know how to do it? 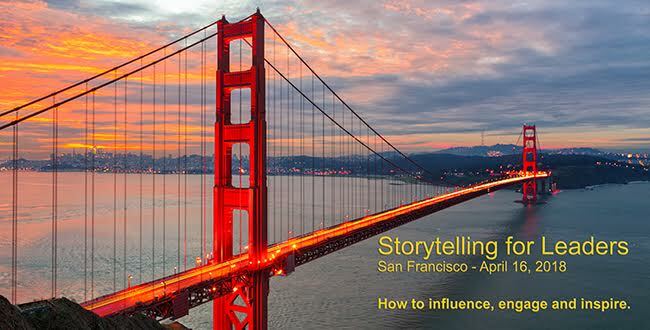 Come join our Storytelling for Leaders program in San Francisco on 16 April and we’ll show you how. Our practical method has a clear process to help you find and tell effective stories. Our work is very popular with tech companies. We’ve worked with Microsoft, SAP, Teradata and IBM, to name a few. We’re a particular favourite of the technical sellers who need to bring products to life for their prospects, rather than just subject them to mammoth slide decks illustrating one feature after the next. So if your job is to persuade prospects to try, subscribe to and keep using your software, then why not join the thousands of other tech pros who have done our story programs and come along to our San Francisco public program on 16 April. Super-early-bird tickets for the session are now available. Learning the basics of finding good stories to tell, what’s a story and what’s not, how to segue into a story and how to finish one, how to increase the power of your stories, how to keep your stories, and the many other practicalities of business storytelling, will reduce your work anxiety, particularly if you work in a story-focused business. Like the best storytellers, you’ll be able to use your own story palette and get great work done. As you can see I was trying something different with this post weaving in the announcement of a public workshop while also making a point about what drives some people in the creative and tech industries to join our courses. Love to know what you think. Pop your comments below. Being a first-class communicator, a compelling presenter and an engaging leader are skills that all of us can develop. Try our Storytelling for Leaders program – a structured skill-building program comprising a one-day workshop and six-months micro-learning to extend and embed your storytelling skills. Hi Shawn! I’m loving your book so far, your storyfinding info-graphic, plus various blog posts as well… this workshop appears to be San Francisco based, have you ever considered coming to Toronto? And for curiosity’s sake, what would be required to make such a visit worth your while?